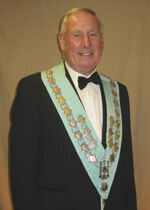 Having been Master of the Lodge twice (in 1998 and 1999) W Bro Brian Whitmore is the current Secretary of Athelstan Lodge, having served in that position since December 2005. The Secretary, as in most organisations, occupies a busy and important position. My duties include preparing the Summons for each meeting and ensuring that every Brother has a copy at least 7 days before the Meeting. The summons must include the date and time of the Meeting and the business to be conducted and contains other information of interest to the Brethren. Minutes must be taken and recorded for all Meetings; again the Secretary’s responsibility. Another important duty is to complete and submit, on time, returns to Grand Lodge and Provincial Grand Lodge and to ensure that all the relevant dues are paid, (in conjunction with the Treasurer). The Secretary is responsible for writing all letters and receiving correspondence on behalf of the Lodge. He must keep all records of members up to date and have a good knowledge of the book of Constitutions and the Lodge bye-laws. An important duty is to liaise with the Master to arrange the Lodge programme for the year and, in addition, to prepare the agenda for each meeting. These are just a few of the Secretary’s main duties, there are many more concerning the day-to-day running of the Lodge. One needs to be able to devote quite a lot of time to ensure the smooth running of the Lodge and enjoy doing the work. I do! The Assistant Secretary of a Lodge is usually the one who takes on the job of taking and preparing the minutes for each meeting, and helps the Secretary, reducing the load.